If you’re anything like me, once the warm weather hits, you’re looking for a new salad recipe to try out to add to the rotation. I have absolutely found one and it is quick and easy. 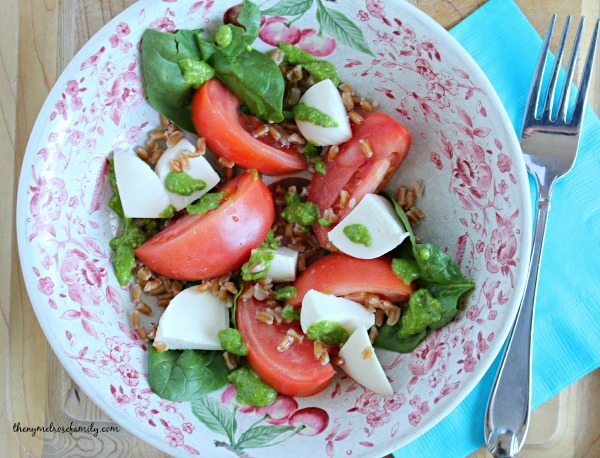 If you love fresh mozzarella and tomatoes then this Caprese Salad with Farro and homemade kale and spinach pesto, is going to become your new favorite salad. This article may contain Affiliate links, but all opinions expressed are my own. We clearly have a thing for Caprese around our house. We routinely rely on our Caprese Kabob Appetizers as our go-to appetizer when friends drop by unexpectedly. I also routinely have a craving for our Caprese Burger. I just can’t resist fresh mozzarella. This Caprese Salad has a hearty addition though. Farro. 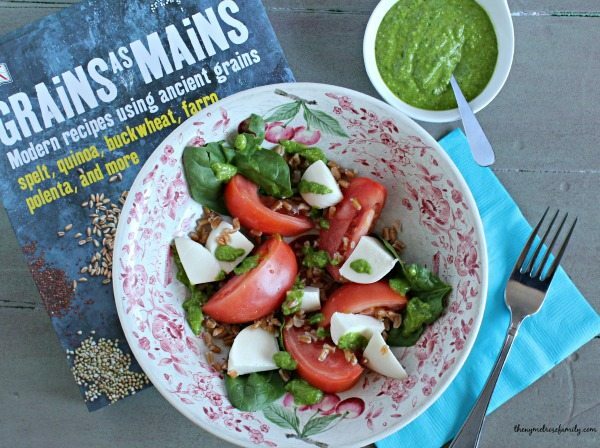 I wasn’t familiar with farro at all, until I was introduced to the fabulous book, Grains as Mains by Jodi Moreno & Sarah W. Caron. The addition of farro in this recipe makes it a hearty salad that would work as the perfect lunch or light dinner. 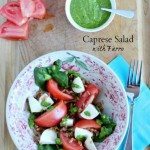 I was drawn to this recipe because it involved caprese while it challenged me to try farro for the first time. The great thing about Grains as Mains is that it creates modern recipes using ancient grains while teaching the novice the benefits and cooking techniques. 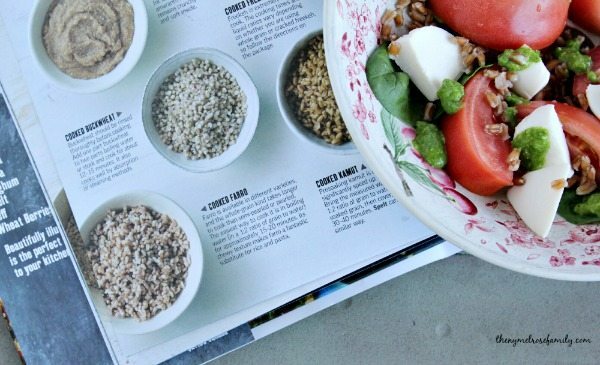 I certainly appreciated the explanation of the grains and loved that I found new ways to incorporate them for breakfast, lunch and dinner. 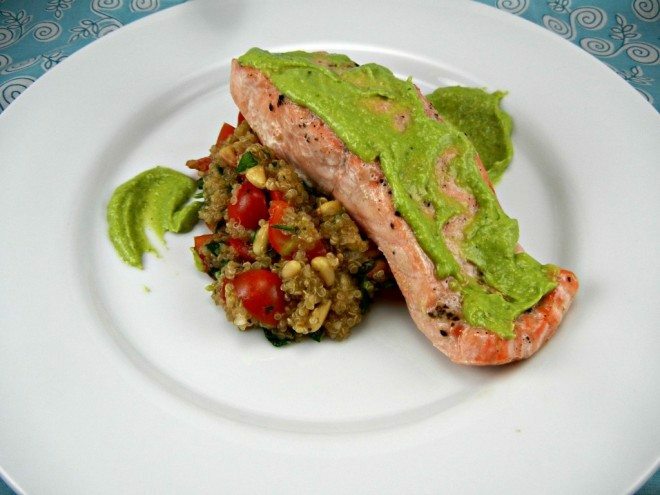 The recipes are easy to follow and every picture is drool-worthy. It is a stunning cook book that is also a reference guide for anyone looking to learn to cook more with traditional grains like spelt, quinoa, buckwheat, farro, polenta and more. Caprese is traditionally made with basil and this salad would absolutely work with basil, but I had fresh baby spinach on hand and it worked perfectly with my kale and spinach pesto. I actually made it multiple times for lunch at work this week. 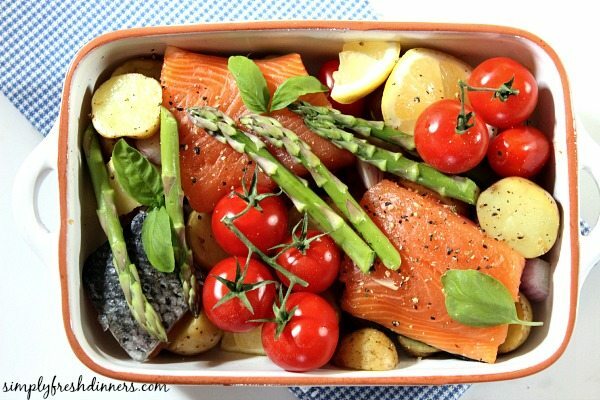 It’s just so quick and easy, while having all those fresh ingredients. 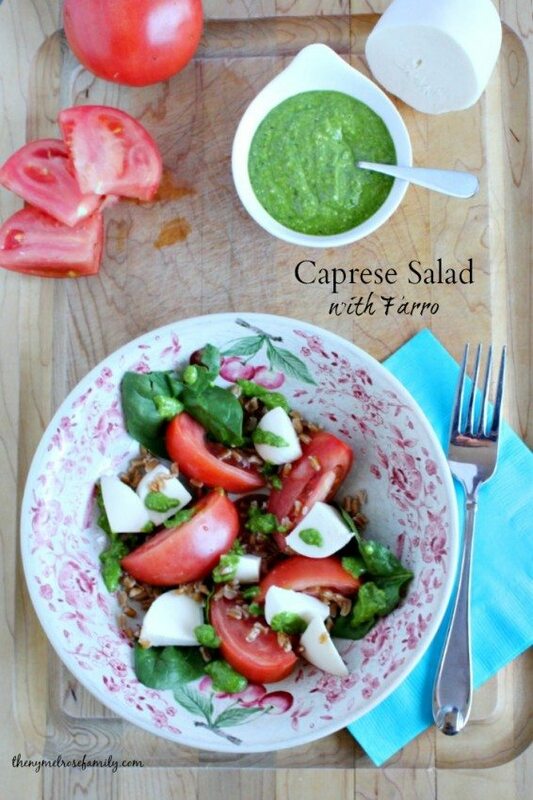 A quick and easy Caprese salad with farro and homemade kale and spinach pesto. Rinse the farro under cold running water and place in a large saucepan and cover with 2 cups of water and bring to a boil. Reduce the heat to simmer for about 40 minutes. Let the farro cool before adding it to the salad. Place the mozzarella, tomatoes and baby spinach leaves in a large bowl and sprinkle with kale & spinach pesto. Add in the cooled farro and mix the salad. Let chill in the refrigerator before serving. We love farro around our house and I have everything except the mozarella on hand. Definitely pinning and adding this to my meal plan for next week. Thanks for sharing!